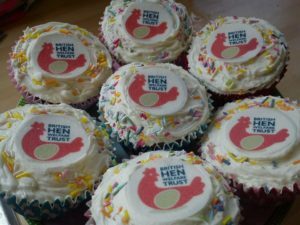 The second ever British Hen Welfare Day was held on Friday, 22 September 2017, and was all about crazy cupcakes! Our supporters, old and new, up and down the country got involved and used their girls’ eggs to whip up some wonderful cupcake creations. Then, they simply shared them with friends, family or colleagues in exchange for a donation – after all , they’re worth it right?! Those who keep their own hens had the added luxury of being able to bake with freshly laid eggs from their own back garden – you don’t get more free range than that. All proceeds raised from British Hen Welfare Day are put towards building the UK’s first dedicated hen welfare and education centre – a Happy Hen Care Home if you will. There was also a wonderful prize for whoever baked the best cupcakes. The winner received a 12-hole muffin pan and a duo-colour icing kit courtesy of Lakeland! For more information, and to let us know you’re taking part in our 2018 event, please email fundraise@bhwt.co.uk.